In line with the trend for sweets to be spiked with salt, I am sharing a recipe for a fusion Asian dessert that is just that. 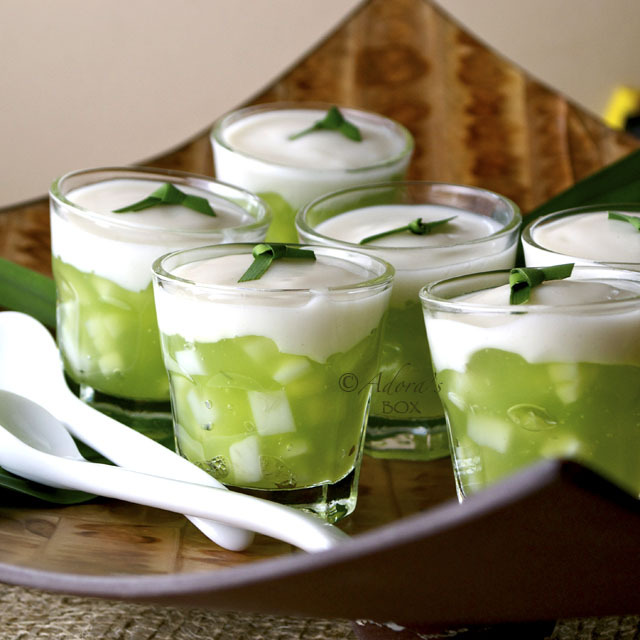 This dessert is made with two of the most popular dessert ingredients in the Far East: coconut (in this case young coconut) and pandan or screwpine leaves. This is my take on a Philippine dessert which has pandan flavoured jelly and buco or young coconut meat dressed with sweet cream. 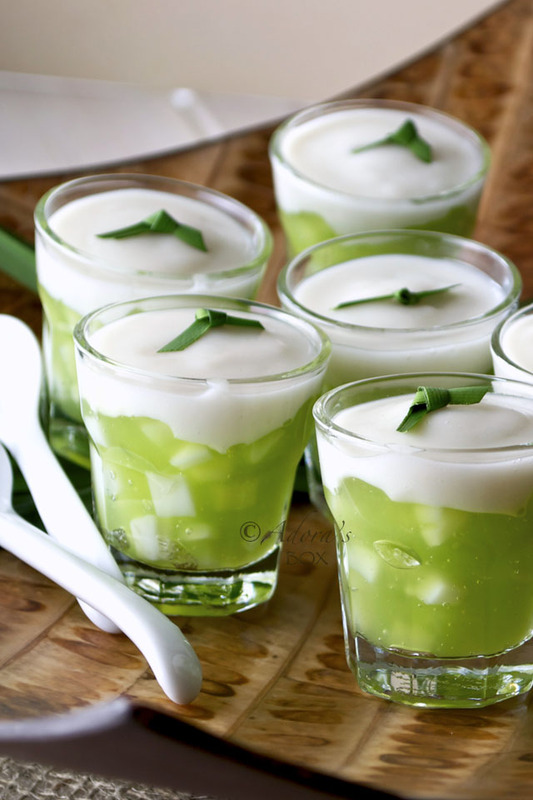 I've taken the very same flavours but taken inspiration from the Thai dessert tako haew (water chestnuts and coconut cream in a pandan cup). I have made the gel with coconut water, pandan essence and young coconut meat and topped it with sweet and salty coconut cream. 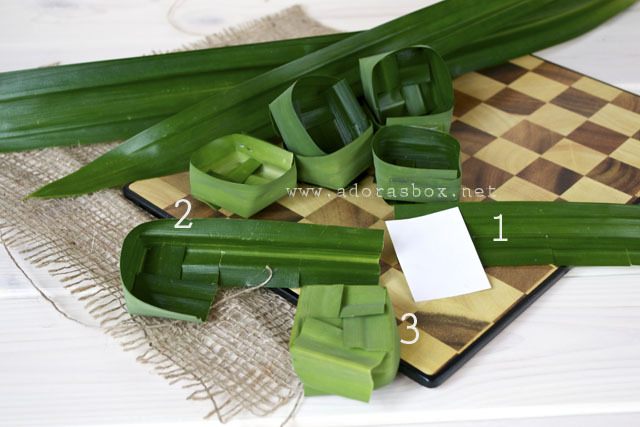 It just makes sense to use a pandan leaf cup as a mold. I have also made some in shot glasses to make, errr, jello shots. Cut 7" lengths of pandan leaf. Make 4 slits on the bottom part (below the rib) 1 1/2" apart to make five sections (I used a cardboard template as a guide to make uniform sections). Alternately tuck in each section to make a small square cup. Tuck in the last flap as shown and staple the side to it together. prepare the filling. Drain the young coconut and reserve the syrup. Snip the pandan leaves in into 1/2" wide pieces. Put the pandan leaves in a small saucepan. Measure the coconut syrup and top up with water to make two cups. Add to the pandan leaves in the saucepan, bring to a boil and simmer for 15 minutes to make pandan essence. 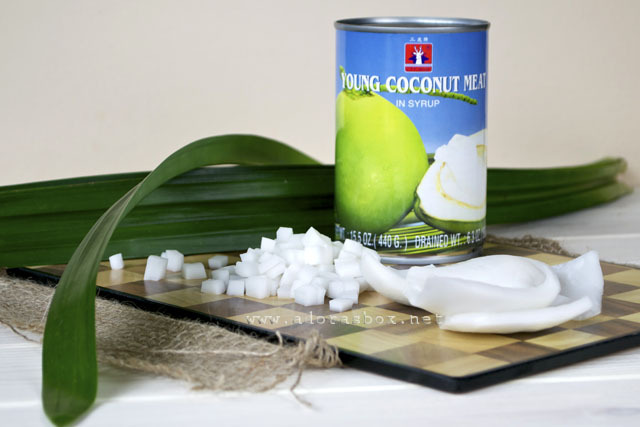 Meanwhile cut up the coconut meat into small cubes. When the pandan essence is ready, strain it and measure 2 c. (you might have to top this up with water). Put back in the saucepan, add the coconut meat and sugar then bring back to a boil. Take off the heat for a minute and add in the corn flour slurry while vigorously stirring. Put back on the heat and simmer while still stirring until thickened. Add a few drops of yellow and green food colour to brighten the colour. 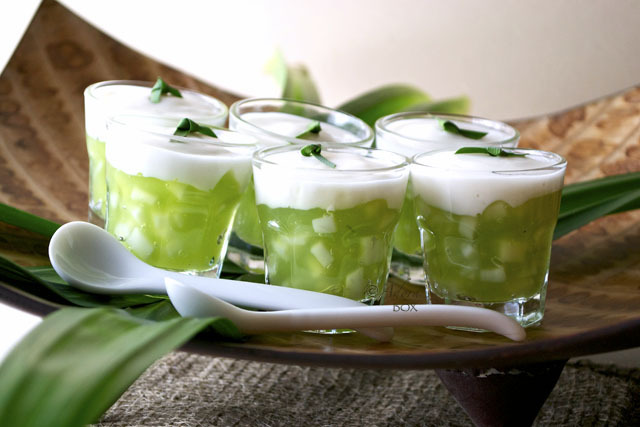 Spoon into the prepared pandan cups or into ramekins or small glasses. Put the coconut cream, salt, sugar and flour in another small saucepan. Whisk very well then turn on the heat on low. Keep stirring until the mixture thickens. Top the pandan gel with spoonfuls of this mixture. Leave to cool. Refrigerate before serving. your photos are awesome! looking at these beauties makes me want to prepare one as well..
You're so creative, Adora! Love the pandan cups! Adora, I didn't realize you'd had a number of pandan recipes on your blog! 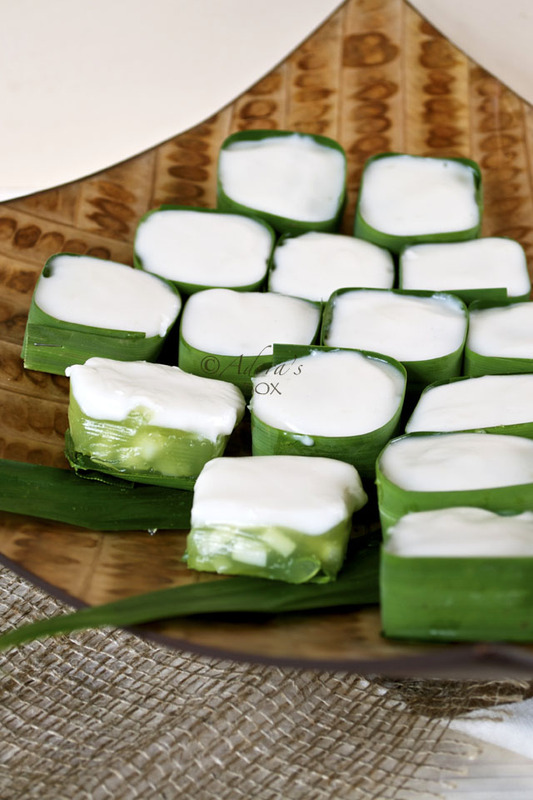 I love the smell and taste of pandan and this Thai sweet-salty dessert is one of my favorites. I could eat a whole plateful to myself...oh, the jelly shot version looks really good too! The jello shots look great. Beautiful presentation!! I am sure is as tasty as it looks. Oh my...Adora, this is super beautiful! And I love the pandan cups!!! I've never had this before but I'm so interested to try this! This dish is completely new to me. It looks gorgeous! The cups are beautiful! 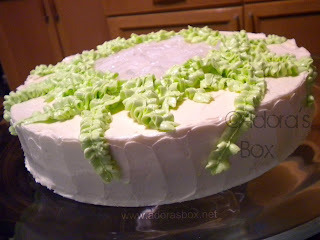 I just love pandan's light, floral flavor. And I like how you used the leaves both as cups and as garnish for the shot glasses. You blew me away with this one!!! 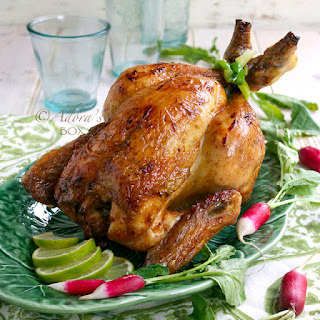 The pictures are gorgeous, the food is beautiful and the recipe - something I have never had or heard or for that matter! A fantastic post!! Interesting, educational and, if I could taste it, I'm sure quite delicious! I love the use of pandan for cups & the jello shots, too! Didn't know buko came in a can, will have to look for those. That is SO cool and creative! I love your pictures and presentation! Buzzed! ...this is wonderfully clever! You are so creative!! I love how you made the pandan cups. The shots looks fantastic! 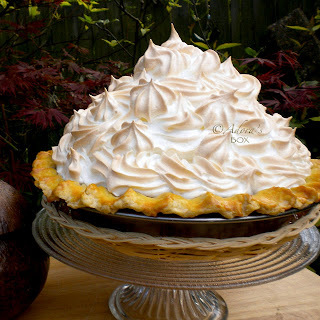 Looks like a very delicious treat! Thank you for sharing.